"Galloway's Ginkgo" is the name that has been given to the largest ginkgo in the arboretum, which is found north of Kirkland Hall near the corner of Barnard Hall (behind the iron fence). 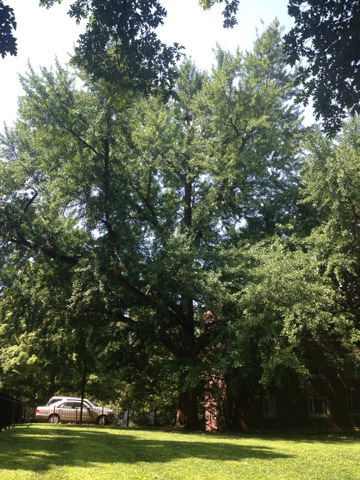 The story of the origin of this tree is told in a blog post and on page 15 of The Trees of Vanderbilt. One inaccuracy of the account in The Trees of Vanderbilt is that it states that "This particular tree has been the progenitor of many ginkgoes in this area." Although this tree may have provided pollen, it did not provide seeds, since it is a male. This tree has a diameter of 100 cm (39 in. ), height of 18 m (59 ft.), and crown spread of 23.5 m (77 ft.). Specimens of this size exhibit the very furrowed bark that is typical of large ginkgoes. The fan-shaped leaves have interesting veins that give the tree its common name "maidenhair tree". This organism is a living specimen that is part of the  Vanderbilt University Arboretum  with the local identifier 2-185. It has the name "Galloway's Ginkgo". Remarks: Individual is a male. Described in the 1994 Trees of Vanderbilt p. 15. Location of individual determined from GIS database.